In 1923, a young boy works hard to learn morse code in order to get his amateur radio operator license and his very own call letters. Everyday he excitedly puts on his headphones and warms up his station, talking to people all over the world. During a far away hurricane, he uses his radio to send out messages to rescue stranded people. 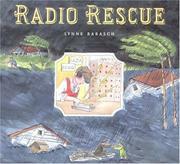 Barasch, Lynne, “Radio rescue,” Children's Picture Book Database at Miami University, accessed April 25, 2019, https://dlp.lib.miamioh.edu/picturebook/items/show/5773.